As long as I’ve been involved in digital marketing, I’ve struggled to explain SEO to people. Many people have a vague idea of what it is and many others are really unsure. This, from what I’ve experienced, has led to SEO being undermined and overlooked in the marketing strategies of SME’s and local businesses. It’s easy to give a short answer, but that doesn’t hammer home the fact that there are a lot of factors involved with SEO and it takes time to get it right. This is why I’ve written a blog post – to explain the how, what and why of SEO. Why Is SEO So Complex? How can you do SEO? Looking for a new website (or an upgrade)? You might be eligible for a 50% online trading voucher! Search engine optimisation (SEO) is the practice of preparing your online content to be found by people using search engines such as Google, Bing and any online platform where users can search for what they’re looking for. In a nutshell, it’s about being found online. Generally speaking though, when people mention the term SEO they’re talking about preparing a website to be found by Google searchers, for a specific keyword or phrase. Everybody wants to be on the top of Google searches for the best keywords! How do we reach the top spots on Google, is the question? Simply put, it’s all about providing Google with all the information about your pages so that it knows what they’re all about. What is each page about? Is it a reliable source of information? It then ranks all the websites so that it’s prepared to give the best set of results it can, for any given Google search a user makes. Over the years, SEO has become increasingly complex. The reason for this is firstly due to the evolutions in the way we interact with the internet. Think about the changes we’ve seen in the last 10-15 years. The internet is primarily a mobile experience now, which has meant geographic specific searches have become important (like restaurants…etc.) and voice search is on the rise these days. While augmented and virtual reality are the horizon too, which will have an impact as well. The second factor and the factor which has made SEO so very complex is the marketers. In the time that it took the phrase “I’ll Google it” to become a part of the modern-day lexicon, marketing teams have been trying to manipulate the search results to favour their businesses – because it is without question the best source of free and fresh, high-quality traffic. To ensure its users were getting the best results, Google had to combat dodgy websites from taking all the top spots and their anti-spam/search-quality department began running algorithms to penalise webmasters who used less-than-honest tactics to get ranked and steal that precious website traffic. It is estimated that there are at least 200 ranking factors, which include things like; how easy it is for website users (and Google bots) to navigate around the website – to the various quality control measures Google have in place. You can read all 200 ranking factors explained by Brian Deane of Backlinko. As mentioned above, website traffic from Google is the best source of new traffic you can get, because the users have a very high level of intent. When somebody is looking for websites like yours, it’s obvious that they are in the market for products, or information very much like what is available on your website and at the very moment when they (hopefully) discover you. Search engine marketing (SEM) is unlike social media marketing or banner advertising – in that it isn’t interrupting the internet users flow, but instead, it aims to enhance it by being part of that flow. You could say that SEO is a non-invasive form of marketing. SEO is about more than just the content of your website though. It includes off-site factors around your online reputation too, such as social media engagement, customer reviews, mentions, citations and the most important ranking factor of all; links to your website (from relevant and reputable sources). This is also a big source of severe penalties from Google, due to the abuse linking receives from black-hat marketers. There are plenty of schemes and scams in link-building, but it’s pretty much inevitable that Google will catch up and punish those partaking in these black-hat methods – something they’ve proven to be dedicated to. Given how complex SEO is overall, you really ought to hire a professional (like me, *wink-wink) to get you off on the right footing with the technical aspects and the more advanced aspects. At the very least, you should order an audit for your website and get some valuable insights, with a list of actions to take. Research the keywords that are most important to your business and use them across all online platforms, whenever it makes sense to do so. This will help Google (and other search engines) to associate your brand name with those keywords. Be sure to tag, label and describe everything you upload online and be mindful of including the appropriate keywords in all that too. Continuously produce original, shareable and linkable content, which is relevant to your industry and helps you to provide real value to people interested in the industry. Again, consider the keywords you use. Consider all users. The internet has firmly shifted to a mobile-first experience. If your website and content don’t make sense on mobile, then you need to fix that ASAP. In short, be sure it is easily accessible on all devices. When adding posts or pages to your website, be sure to follow the SEO writing best practices as you go. Start with a keyword or phrase and be sure to include all the relevant tags and descriptions. Link out to highly reputable sources for reference or further reading, plus try to encourage readers to visit other pages on your website too. Include links to your website in all publicity materials and actively work to earn links to your website from relevant sources. Rankings. This is how google sorts results. For example, if you sell boutique fashion online, you’d like to be found on page one if somebody searches “boutique dresses” on Google. But, there’ll be other websites trying to do the same thing. Google will decide which page is most relevant to the search and display results in a sort of a league table. If you’re on page one, you’re doing good. However, if you’re on page 2 or beyond, that’s not good at all. Keywords (or key-phrases). These are the main words or phrases that the page is about. For example, a product-page selling a black vintage dress should be optimised for the optimal keyword for this product. Longtail keyword. These are keywords that have a lower amount of search volume but are more specific and carry more intent. For example “red Nike running shoes” is a long-tail phrase. It’s a specific query and the searcher is expecting it to be an easy job finding the shoes they want once they click a result. Fathead keyword. It’s the opposite to long tail keywords. It’s high search volume, but much vaguer. If you search “shoes” you could get an array of results. This could range from men’s or women’s, all colours, styles and so on. LSI (latent semantic indexing) keywords. This refers to terminology which relates to your main keyword. The idea here is that Google can establish if you’re naturally versed in this topic and not just keyword stuffing to trick the bots. This improves written content for the reader too. Keyword stuffing. Over-doing it with keywords, in a manipulative way and causing a poor experience for the reader. Black-hat tactics. This means to use tactics which go against Google quality guidelines and try to go unnoticed. It’s the dark side of SEO. You’d probably get some short-term success, but it can all get pulled away from you just as fast. Google will de-index culprits and recovering can take months or years. White-hat tactics. This is clean work, which follows guidelines and best practice. You’re unlikely to have any huge short-term surges in organic search traffic, but in the long term, you’re better off. Once you build your reputation up and continue posting great content, SEO will keep on paying off. Organic search. This refers to free SEO traffic, as an opposed to paid traffic (from adverts). SERP. This simply means ‘Search Engine Result Page’. Naked URL. A plain link with no anchor text. Metadata. The page’s title and description are used to preview a page in Google search results. It’s not necessarily visible on the web page, but it is in the code and Google knows how to find it. WordPress users can make this easy using a free plugin called Yoast SEO. The plugin is great for guiding your on-page SEO. Heading tags. On your page you should have a main heading, this will be tagged as h1. Then you can have secondary headings, which are tagged as h2. If you need sub-sub-heading, there’s a h3 tag… it goes as far as h6 tags – if there’s ever a reason for that! Microdata. These are tags that wrap around the content on your page. It’s not visible on the screen, but Google can learn about what the content is. For example, there’s a set of microdata tags for recipes. Microdata allows us to appear in some of Googles advanced preview features, known as rich-snippets. You can read all about this on schema.org. *Be warned, it is very techy. 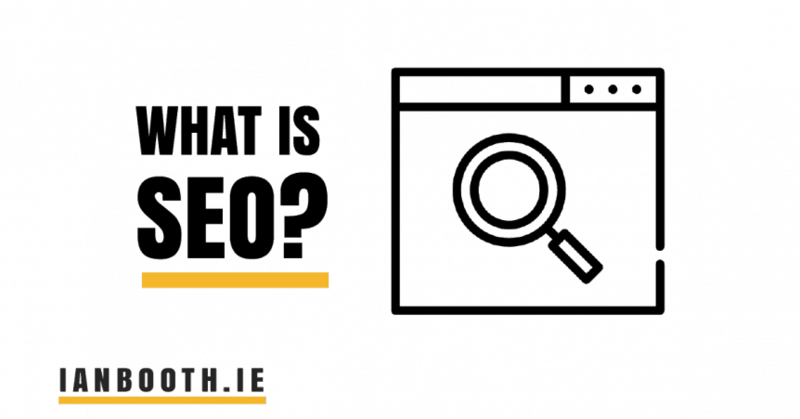 If you need some help with SEO on your website, please get in touch with ian@ianbooth.ie and we can discuss an SEO audit or an ongoing SEO plan to grow your business online, using organic Google traffic. Looking for a new website (or an upgrade)? You might be eligible for a 50% online trading voucher!